These premium darts are made of 90% tungsten and are packaged in our jewelry-styled Ultra carrying case(24 gr. Only) or the Euro-Pak. 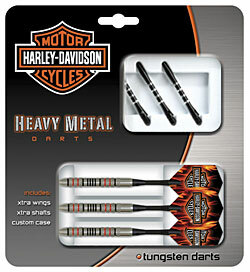 Whether you are a casual player or tournament tested, the H-D® Heavy Metal Darts are proven winners.